I firmly believe that our bodies are designed to heal themselves, if we just give them the tools to do it. Our modern medical system is amazing for repairing trauma and many other health issues, but we've lost track of many “back to basics” things we can do to improve our health. Since I couldn't tolerate the drugs, I started making small changes in my diet and lifestyle. Nothing drastic – I didn't really have a lot of energy to spare. Weight started coming off, and I had more energy. My hair got softer, my skin got smoother. I did find a doctor who was willing to prescribe natural thyroid medication, but I hope to one day heal my thyroid. In contrast to the “thyroid death sentence” issued by my first doctor, who said it the disease could only get progressively worse, I have found people who have healed Hashi's through nutrition and lifestyle choices. The more I learn, the more I realize I've barely scratched the surface of natural healing options, but I figure if what I've learned has helped me, maybe it can help someone else, too. 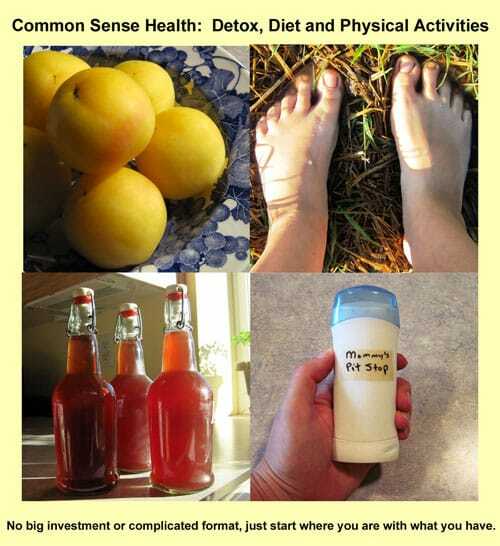 Common Sense Health E-book is organized in three sections: Detox, Diet and Physical Activities. I start with detoxing because it's really tough to heal your body unless you get rid of whatever's causing problems in the first place. In the Diet section, I discuss the big problems with many of our current diet trends, such as low-fat products, heavily processed foods, and GMO consumption, and steer you towards more nutrient dense, healthier options. Physical Activities include exercise, oil pulling, deep breathing, dry brushing, cold showers, barefoot therapy and practicing gratitude. Some of the material has been covered, in part, on the blog, but the book has given me the opportunity to update and add additional information. Still not sure? You can download a free chapter here and take a peek. Check out page two of the post to see photos of me over the last several years. August doesn’t look like he has changed! Neither do you!! I’ve never checked out your site. Can’t wait to look it over. I guess I’ve been too busy. Ps, i have Fibro, Chronic Fatigue, and Menieres Disease. They way you described how you feel/felt, is exactly like me! Some days i cant do anything! Im really looking fwd to your book. I need something that takes its time, as my ‘brain’ even exhausts me if i have to concentrate too hard at one time…like this email…lol (and i have the ‘daydreamer’ form of ADD – makes life VERY difficult). But im a very creative type, so WANT TO be busy etc. I hope your book helps me. Im not a good “eater” so im sure your book will help, plus im very much into providing as much for my family as i can, and want TO teach my children the same. 😉 Thanks again and have an awesome day! Oh nuts! Was working just fine yesterday when tested. On it right now! Yes, but I haven’t figured out how to set up a matching discount yet. Working on it! I would love to win your book. Love all the info. you share. I have been on a personal journey of my own where I have been trying to figure out what is true and what is bogus when it comes to health. I do not believe the government knows what is best for my health. I would really like to know the TRUTH about what is healthy and what isn’t. I don’t think it’s a one size fits all type of thing. Everyone’s body is different. I am currently trying to learn more about helping my body to heal itself through using whole foods. Sometimes it seems like such a daunting task…there’s so much information out there! But I am enjoying the journey! I’d love to win a copy of your book. Thanks! I’d love to learn more about GMOs. This looks like a great book! I’m on a personal health journey…while I haven’t seen huge results for myself, I see them in my husband and boys. I’m always looking to see what else I can learn! I would like to learn more about growing healthy foods in a natural way. I’d like to learn more about healing the body and detox. Your sentence, which includes this quote ” our bodies are designed to heal themselves, if we just give them the tools to do it.”, is what I am looking to discover. I’m 60 yrs. young, but due to the advances of age, I need some tools to help put the word “young” back into my achy joints, dull hair and skin tone, etc. I plan on being around another 30 or 40 yrs,. so it sure would be nice to live without all these creaks and groans whenever I stand up! LOL Also, with allergies to most medications (dealt with that issue most of my life), I really would like to learn more ways to treat myself as needed in a Natural way than to just cross my fingers and pray that I won’t be so sick that I can’t just “ride” it out. Rather debilitating at times, believe me! Amen, Kathy! I don’t want to be a supermodel, I just want to be able to move without pain and get done what I need to do in a day. I “fell off the wagon” for a bit this spring and stopped following my own advice, and I could really feel the difference. Back to better habits again, and my body is responding in kind. Just found you through Kitchen Stewardship…looking forward to exploring your site and ebook! Oops, just saw that I was supposed to comment with something I want to learn more about. Probably the biggest is healing various health issues through nutrition. I’d be interested in learning more about fermented foods. I find I can not take most medications doctors prescribe. I would love to learn more about how to heal my body naturally. I found you through Kitchen Stewardship. I’m interested in learning more about GMO’s, and just being healthier without chemicals and medicines. I would like to learn more about detoxifying the body. Thank you and God bless. I would really like to know more about skin brushing – this is a new subject to me. I’ve been muddling through “natural” and “organic” for a couple years. So much information to take in and decide what to follow through on and what’s just crazy. It’s enough to make my brain hurt. 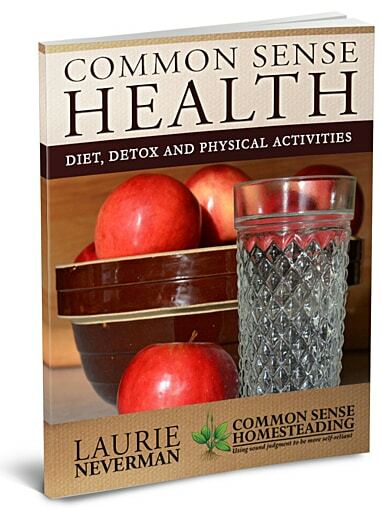 I love the sounds of “Common Sense Health” and would love to win a copy. I can’t wait to learn more healthy alternatives. I am a counselor with a focus on health and total wellness. I try to learn as much as I can about natural healing and prevention so that I can be informed and helpful to others! This ebook sounds like it would be a great resource for me. I love common sense! I need this book. Thank you for the chance . This looks like a great book. I’ve never heard of oil pulling before. I am interested in weight loss since I think all my other problems stem from my obesity! Hi, I am over here from Kitchen Stewardship. I would love to win a copy of your ebook! I looks great! Just found you through Kitchen Stewardship…will be following now. The thing I want to learn is healing my body naturally. I want to learning more about detox and body brushing. Sounds like we are heading the same direction. Can I walk with you awhile and learn what you have to say with your writings? Then I will process them and use my common sense. New to your blog but looking forward to reading more! I have thyroid issues and am on medicine for it. I’m VERY interested. I’m nearing peri-menopause and would like to learn as much as I can to handle symptoms and changes naturally. The topics look really interesting and beneficial! I came from Kitchen Stewardship. Thanks! I’d like to know more about eczema and joint health…my son is struggling with horrible eczema right now and my boyfriend having joint pain. I too have had thyroid issues for most of my life. No doctor would diagnose since blood levels were normal. Unfortunately, I developed thyroid cancer after my first pregnancy, so now I don’t have my thyroid. Levothyroxine has worked fine for me so far, but I sure wish I had changed my lifestyle and eating habits before I was forced too…I’m sure I could have healed it naturally! You live and learn I guess! Your book looks like a great resource…would love to know more about oil pulling and if it could help sensitive teeth. I would love to learn more about the steps you are taking to try to heal your thyroid. I’m still on this basic program (https://commonsensehome.com/my-thyroid-journey-part-one/), although I have added Armour Thyroid. I’m interested in the ideas of dry brushing and earthing and how they benefit the body. Thanks! I would like to know more about barefoot therapy–“Earthing.” Sounds super interesting and may be something we really need to focus on. Thanks for the opportunity to win! I’m interested in learning more about healthy dietary fats. Thanks for the fun giveaway! Common Sense??? Just asked my parents what is GMO–both of them are farmers’ kids–and they had NOOOOO idea. Wow! They say they have “common sense” and city people don’t. As my father had a container of RoundUp in his hands…have to kill those dandelions. It’s done. Stupidity is rewarded. Common sense is penalized. I would like to learn more about oil pulling. I’d like to learn more about season allergies for my poor husband whose sneezing is honestly atrocious at times! I’m brand new to your site… would LOVE to win this book! Just starting on a REAL FOOD journey. Sometimes all the information on natural wellness/health/real food etc is so overwhelming! It makes one feel like it’s impossible to be “good enough.” I have been trying to take baby steps, use common sense, keep an open mind, and improve my health without stressing about it. This looks like a great ebook. I would love to win a copy! Thanks! Love the idea “Common Sense Health”. Seems to be a huge, rarely spoke of, missing piece of the health/real food choice. With such conflicting information out there, & how important balance is, this “little” idea is significant. (In my opinion, anyway. 😉 ) Just found you through Kitchen Stewardship & looking forward to reading your book! Welcome, D.D. They call our gut our “second brain”, so it makes sense to me that what we eat plays a big role in our health. I want to learn about natural alternatives for tooth brushing, that don’t cost a fortune. Your story is much like mine except mine has to do with Fibromyalgia. I don’t tolerate drugs well so the more natural I go the better I feel. The more Ive learned the more blessed I feel that I didn’t tolerate the drugs. I’d like to learn more about natural ways to reduce muscle pain & fatigue. I have chronic pain from old injuries & fatigue. Both are exacerbated by Lyme Disease. I would love to read more about natural products for myself and my home. I somehow missed this…glad you reposted about it today! I am so interested in what you’ve researched. I’d love to know more about dry brushing and I’ve always been a barefoot kid and now that we are in the country I find myself going without my flip flops all the time…I always tell myself I’m earthing thanks to you!!! I’d Love To Learn Everything You Have To Offer! However, I have to take Coumadin for the rest of my life and need to learn more about the Herbal, Essential Oils and Alternative Medicines I can use while being on Coumadin as there are so many things that I have read that shouldn’t be taken and/or used while on Coumadin. I DESPERATELY NEED HELP WITH THIS SUBJECT! I too have hashimoto’s and have had some success with diet, but would love to add essential oils and also read your e-book to see what else I can do. Thanks for a great site with so much helpful information. I’d like to learn more about healing cancer with diet. This all sounds almost too easy, but I’m ready to try. I don’t have a kindle or any other book reading machine…..well except the computer. How do I get a copy of your book? If it is only in E-print? You can read the book on the computer just fine – it’s a pdf file. I read e-books that way for years before I finally bought a kindle. Since it’s my first book and a fairly light read (<100 pages), it's not worth the expense of paper publishing, although you could print it out, if needed. My goal for 2013 is to prep the next one (Common Sense Preparedness) to have ready to pitch to a published by the end of the year. I would like to get the book, but I have a Nook e-reader. Can I get it for that somehow? Thanks! Does your Nook ereader read pdf files? If so, you should be good to go with the regular version of the book (not the kindle version on Amazon.com). I wish I found your website 2 years ago when I was diagnosed with Hashimoto’s Thyroiditis. I gained more than 50 lbs in less than a year and ended up in ER with my body completely puffed up, brain fog, swelling of the tongue to the point I couldn’t talk and slept 15+ hours a day. Was unemployed at the time and had no health insurance otherwise I would have gone to drs. sooner. I am on Levothyroxin now and want to get off it. My dr also told me that the thyroid was basically dead & I’ll have to be on pills for the rest of my life . I’ve changed my eating habits to include lots more vegetables (organic only) and eat almost no meat or processed foods. Dr. put me on statin drugs for cholesterol though before the diabetes diagnosis, it was considered NORMAL, but he stated it’s a different range for ‘normal’ when you’re diabetic. The same Dr. last year had stated I’ve crossed the line to diabetes, and though I’m not on medication for it, he put me on blood pressure pills in January (my BP was on the high end of NORMAL — not high. ) In the past month my tongue started swelling again and my allergist stated that it was the BP medicine causing it. I’m now off the statin and BP meds and want to detox. I read a book last year stating even if you just do diet and exercise recommended by drs, you’ll still end up with Type 2 diabetes and need medications. The book suggest vegan diet, and the friend who gave it to me said he only eats vegan 2-3x a week now, the weight is off and he’s not diabetic…self cured. I need to find a good holistic doctor to work with me. I’ve been organic on this 1/2 acre for 10 years now.